Keep up to date with our latest developments and find out more about what we've been up to. A record number of visitors will add a touch of gloss to this year’s National Painting and Decorating Show. The two-day crowd-puller is shaping up to be the biggest in its 21-year history with organisers pulling out all the stops to make the UK’s biggest annual trade show for painters and decorators another memorable event. On December 1 and 2, the award-winning Ricoh Arena in Coventry will buzz with thousands of visitors from around the UK and overseas eager to see more products and demonstrations than ever before. Anyone looking for the latest materials and techniques will be able to find them all under one roof as manufacturers unveil the newest ideas and innovations in the painting and decorating industry. There will be products available to buy, a programme of speakers and master classes demonstrating techniques and new coatings and giving advice on the best practice. Visitor numbers have risen dramatically in recent years – a testament to the show’s popularity. Last year’s event was a huge success and this year’s promises to be even better with more going on than ever before. The Midlands this December is the place to brush up on what’s hot and what’s not in the painting and decorating world. The show is the UK’s only dedicated nationwide event for painting and decorating professionals. As well as being able to pick up fresh ideas and technical tips, those attending can also bag themselves some great discounts and special offers on a big range of products and find out more about new business-boosting possibilities. It's also the chance to get bang up to date with industry news and find out what they can expect to see in the coming years. Visitors will be spoilt for choice with many stands provided by regular and new exhibitors ranging from major suppliers to small merchants showcasing business services and products such as coatings, wall coverings, finishes, abrasives, brushes, fillers, tools, clothing and vehicles. 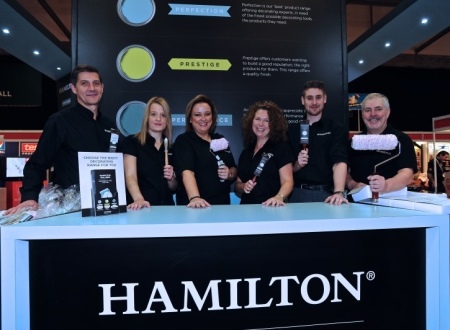 Hamilton will once again be displaying at the show (which runs from 9:30am to 4pm both days), with our very own Mark Davies presenting a ‘Masterclass’; giving invaluable tips and tricks to use with your Hamilton products as well as helping with techniques for the best finish and supplying knowledge on the best product choices (check out our Knowledge Room). The event is sponsored by Professional Painter and Decorator magazine and supported by the Painting and Decorating Association and the Painting Craft Teachers Association.